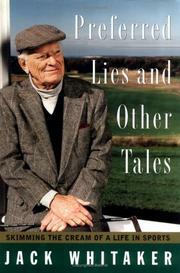 A genial but poorly conceived series of recollections by sports announcer Whitaker, perhaps best remembered today for his coverage of professional golf. Whitaker, a native of Philadelphia, started out broadcasting Eagles’ games from Franklin Field back in the 1950s. He spent the —60s and —70s with CBS, moving on to ABC Sports for the remainder of his career. In his haphazardly arranged account of things, Whitaker is vague and sparing with details and dates, relying on anecdote and the personality profile to move things along. He opens with Super Bowl XXV, trips back to Super Bowl I, and then, confusingly, jumps ahead to Joe Namath’s shocking prediction of victory over the Baltimore Colts in Super Bowl IV. Nowhere does Whitaker make clear whether he was present at any of those games. He does, though, make the cogent observation that the hoopla over the brash Namath took place when “the game began getting lost in the surrounding entertainments . . . and became a festival . . . one of the great anticlimaxes in sports.” Whitaker recalls the early days of televised pro football and the birth of CBS’s —The NFL Today”—a program that he helped to found, only to be abruptly replaced by Brent Musberger. He also looks back at the first television broadcast of the PGA Championship in 1962 and all the attendant logistical problems of cameras, angles, and simultaneous coverage. Most enjoyable are his profiles of golfers and friends, such as Gene Sarazen, Byron Nelson, Sam Snead, and Jack Nicklaus. He also takes a pleasant, wistful look at favored New York watering holes of another era, such as Toots Shor’s, Jimmy Ryan’s, and Mike Manuche’s. And he recounts the little-known “strange day” in sports history when the great Spectacular Bid, the only horse entered in the 1979 Woodward Stakes, loped around the course alone. A bit more framework and background on Whitaker and some semblance of chronological clarity would have given this some lift, but sports buffs will enjoy the anecdotes.